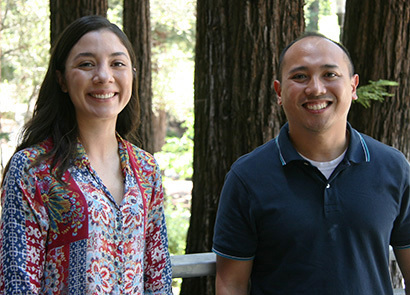 The Howard Hughes Medical Institute (HHMI) has awarded prestigious Gilliam Fellowships for Advanced Study to two UC Santa Cruz graduate students, Gian Carlo Parico and Stefany Rubio. The Gilliam Fellowship program recognizes exceptional doctoral students who have the potential to be leaders in their fields and the desire to advance diversity and inclusion in the sciences. Parico is working with Carrie Partch, associate professor of chemistry and biochemistry, to study the regulation of the biological clock that drives the body's daily rhythms. In particular, he is investigating the deregulation of circadian rhythms in people with delayed sleep phase disorder, which causes them to be "night owls," falling asleep hours after midnight and having trouble waking in the morning. Parico, who immigrated to the United States from the Philippines when he was 10, is the oldest of three boys raised by a single mother. After earning a B.S. in bioengineering at UC San Diego, he put off graduate school and worked in the biotech industry for six years to help put his younger brothers through college. During that time, he was active in outreach programs to elementary schools serving disadvantaged populations. Now he is mentoring a student in one of the STEM diversity programs at UC Santa Cruz. "I hope to empower students from all walks of life through education, mentorship, and outreach," Parico said, noting that he had benefited from financial aid and research mentorship programs himself. "I feel that I should pay it forward by participating in and even establishing similar programs." Stefany Rubio is studying breast cancer and the regulation of mammary gland stem cells, working with Lindsay Hinck, professor of molecular, cell, and developmental biology. Her interest in biomedical sciences came from watching her mother's struggle with breast cancer. When Rubio was 12, just four years after her family had immigrated from Mexico, her mother died and she and her sister entered the foster system in California. She lived in seven different homes and attended 14 different K-12 schools, and she says she "loved every classroom." "I believe my desire to pursue a professorship is rooted in the positive impact of my teachers and mentors in shaping my life," Rubio said. "I am passionate about mentorship, and I intend to focus my energies on foster youth." As an undergraduate at San Diego State University, Rubio served as a student mentor for the Guardian Scholars program for former foster or homeless youth. At UC Santa Cruz, she is mentoring a student in UCSC's Smith Renaissance program for foster youth, and she is working with Hinck to start a new program to engage local foster youth in summer research opportunities. "I know that foster kids have what it takes to be STEM professionals, and I intend to devote my career to both cancer research and empowering these kids to succeed," Rubio said. The Gilliam Fellowships for Advanced Study program promotes excellence in the life sciences and related fields by supporting Ph.D. students committed to a career in academic research and faculty and training programs dedicated to developing the talents of promising graduate students from underrepresented groups.